Blinky, The Friendly Hen, has been dead for four decades but her reputation has rarely faded thanks to Jeffrey Vallance. The artist purchased a roasting chicken at the grocery store and proceeded to bestow upon her the funereary rites more commonly reserved for devoted Catholics. She was laid to rest in a satin-lined chicken-sized coffin and interred at the pet cemetery with a granite headstone. This bit of art and performance caught the attention of Dave Letterman, who interviewed Vallance on his late night show in 1983. The legend of Blinky and the art of Vallance were a quintessential part of the 1980s contemporary art scene in L.A., part of a larger movement to incorporate the breakthroughs of ‘70s performance and conceptual art with themes from popular culture and an inventive making of objects. Blinky The Friendly Hen: 40th Anniversary Exhibition at Cal State Northridge’s Art Gallery introduces the original and more recent explorations of the legend of Blinky, which is rewarding for dedicated fans and recent converts. Jeffrey Vallance Blinky Manger Scene, 2018. Photo by Hunter Drohojowska-Philp. Blinky was never simply a dead hen but a vehicle for Vallance’s sincere and strange investigations into the rituals and meaning of life, death and transcendence. One room of the gallery has been transformed into a blue-walled Relic Chamber with niches displaying chicken-related symbols of devotion. A small chicken bone in a gold baroque frame or a chicken-shaped wood platter covered in tiny golden milagros of chickens. 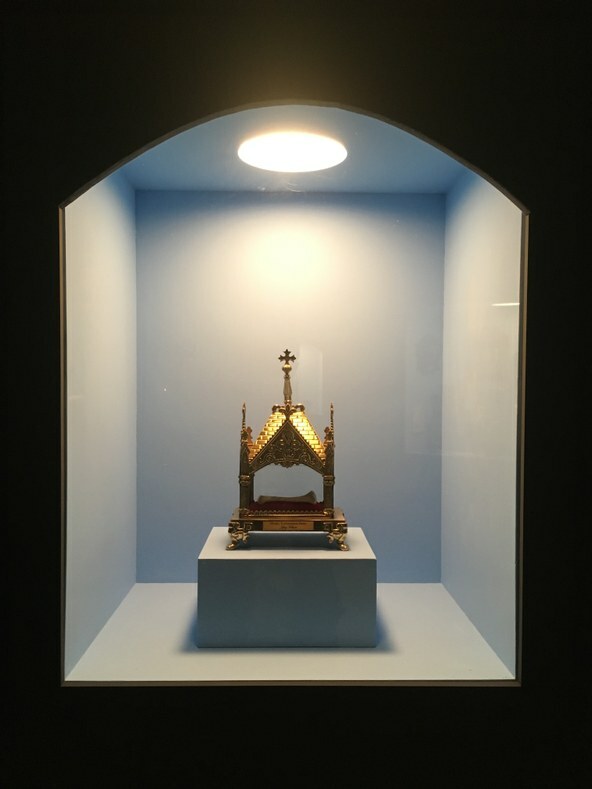 Many pieces are modeled after the shards of bone or bits of hair determined to be sacred relics of saints or apostles. Each was made with meticulous, if hilarious, attention to detail. Jeffrey Vallance Blinky Exhumation Bone, 2007 Courtesy of Tanya Bonakdar Gallery. 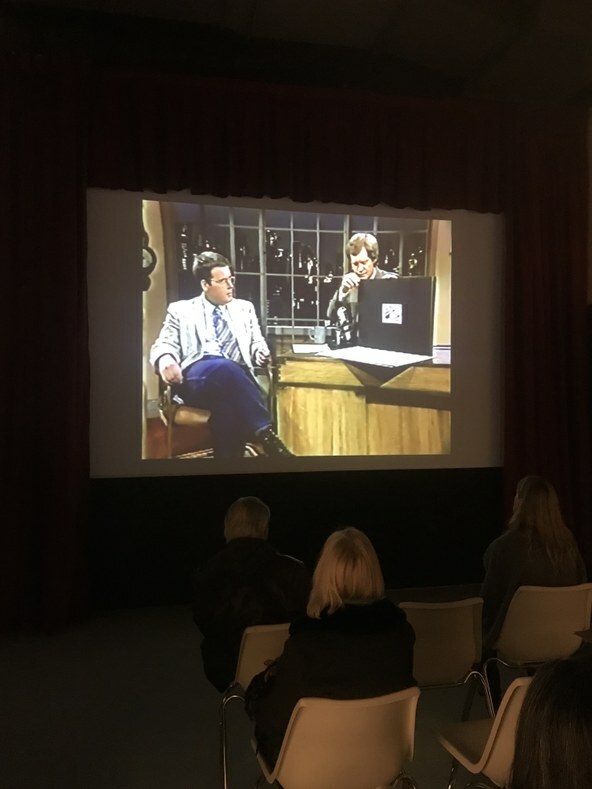 The larger gallery features collages, sculptures, paintings and drawings by Vallance, all of them concerning the tale of Blinky, while a curtained screening room shows a series of Blinky- related videos, including that of Letterman, as well as the video of Blinky’s disinternment. One decade after the buriel, Vallance and video artists Bruce Yonemoto and Norman Yonemoto documented the removal of the small casket. The video shows, in deadpan documentary style, how it was opened, the chicken bones removed and an autopsy performed to determine the causes of Blinky’s death. 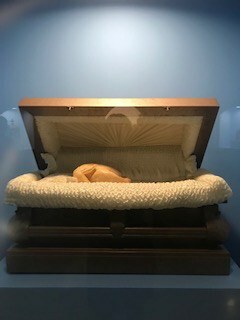 Jeffrey Vallance Blinky’s Coffin, 1989 Coffin with plastic chicken replica, paper towel. Courtesy of Barry Sloane. Is Vallance trivializing centuries of elaborate religious rituals by replacing a human being with a chicken? Not at all. It may seem absurd to give such honors to plucked and pre-packed poultry but it draws attention to such rituals and even reasons for their enduring sustenance. 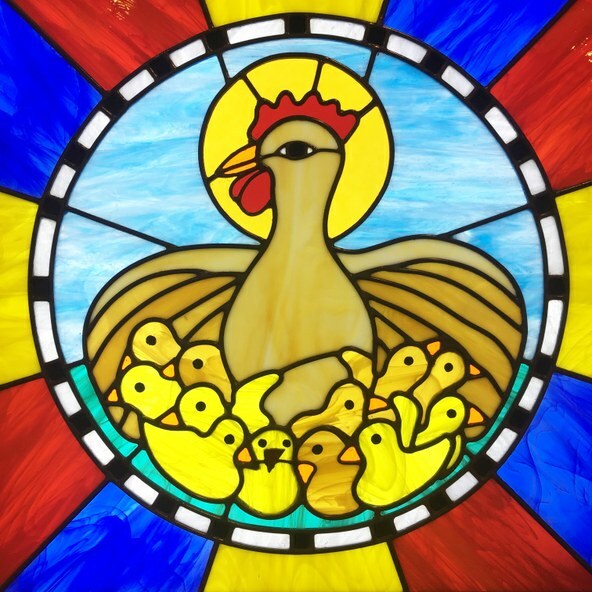 Jeffrey Vallance, Divine Mother Hen, 2018 Stained glass, metal, wood. Photo by Hunter Drohojowska-Philp. 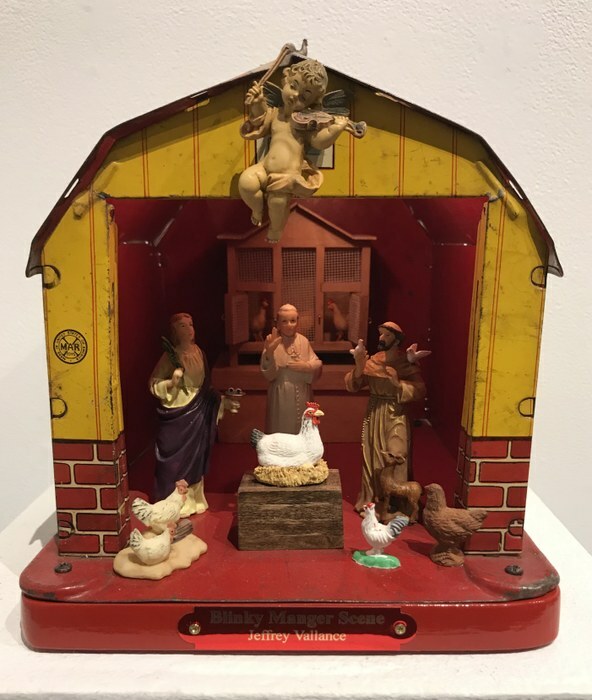 Mostly, it refers to Christian rituals but a third gallery includes a selection of items purported to support the role played by chickens in other religions and cultures, even Buddhism. Of course, this means a lot of decorated eggs. Chapelle de Poulet, Vallance’s seven-page thesis on the centuries old reverence for chickens, is available gratis and worth a read. Since CSUN is Vallance’s alma mater, art department faculty and other friends were invited to contribute their own Blinky- related art. 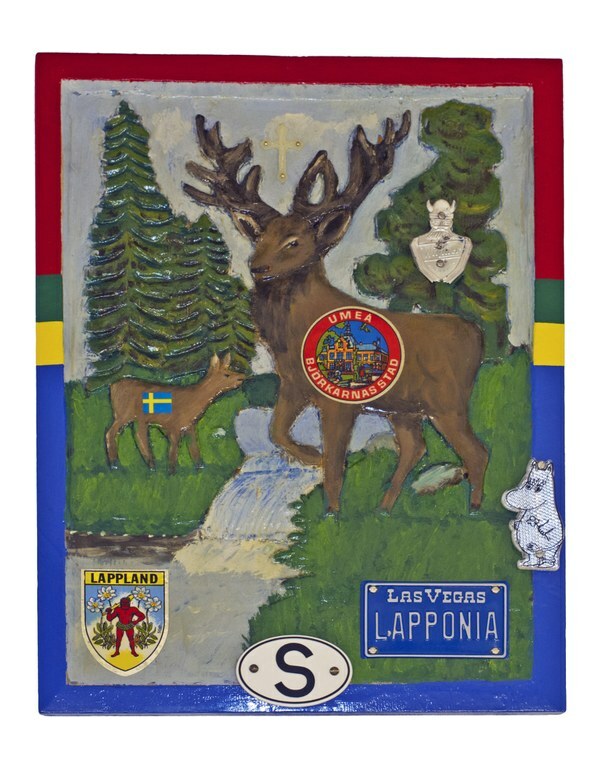 The show within the show includes Lisa Adam’s small square painting of rooster designated “Blinky’s Dad.” Samantha Field’s grisaille picture of an overhead plane dropping shards of confetti or worse represents Chicken Little’s worry that the sky is falling. Marnie Weber’s Blinky is a chicken headed sculpture growing from a pot. Students, too, were asked to respond. Not to the saintly Blinky, but to her satanic nemesis, that mass-murdered of chickens: Colonel Sanders. Anchoring that display is Vallance’s own work, a statue of the familiar white-suited gentlemen under his own flag. Don’t miss the gift shop with an assortment of Blinky-related souvenirs. Chickens are not the artist’s only obsession as you can see in Jeffrey Vallance: Other Animals, the show at Edward Cella Art and Architecture. The representation of animals is pre-historic, symbolic or mythic as well as actual. Vallance incorporates that awareness in his faux naif methods of illustration. As in the saga of Blinky, his child-like drawing styles belie complex meanings. Both shows continue through March 16.